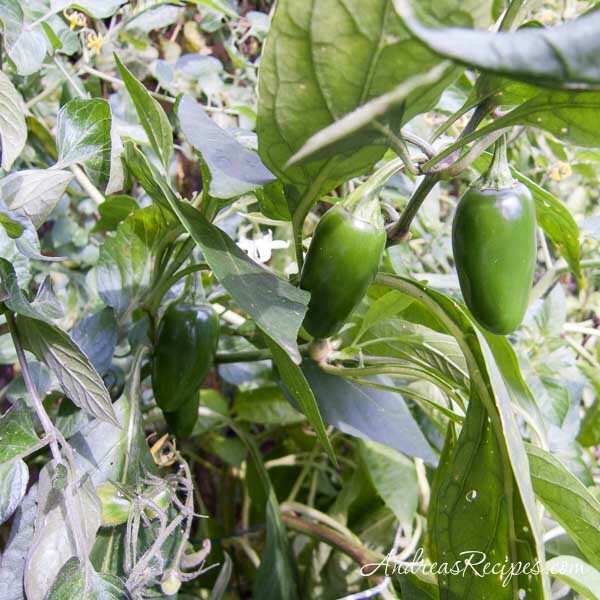 The jalapeño plant is holding its own in a jungle of grape tomatoes, bell peppers, and tomatillos. Even caged, the plants around it spread so much they lay over it, and most of the time I have to go under the deck to reach the spicy little gems. The plant is about three feet tall and has been a prolific producer. Every time I glance at it, I see more little peppers sprouting or flowers in bloom, and we’ve had them overflowing in the kitchen. At first we tried to encourage more production, but now we think we have enough jalapeños to last us until next summer, so we’ve left the remaining peppers on the plant to encourage them to turn red, which is the first step in making chipotles. We looked into making our own chipotles, but once we learned the process takes several days of smoking and tending, we decided to continue buying them and freeze the rest of the jalapeño harvest. Supposedly there are short cuts, such as using a dehydrator prior to smoking, so we might give that a go if we get enough red peppers before the first frost. Jalapeños, like any other chile pepper, has a range of heat based on the Scovill scale, and supposedly you can roughly determine the amount of heat the pepper has based on its appearance, though this method is very imprecise. Green jalapeños have less heat than red, and peppers with scars have more heat. The more scars, the higher the Scovill Heat Units (SHU). For some reason our jalapeños have a real kick this year, more so than in the past. Upon first glance, the 12 ounces of jalapeños called for in the recipe may not seem like a lot, but these peppers don’t weigh much, and after I weighed them out we had 25 spicy green jalapeños. To keep the jalapeno jelly on the mild side, I did not add any of the middle membrane, and it still had a slow burn with a bit of tingle. If you want to bring up the heat a bit, put in a few of the membranes when you run the peppers through the food processor. 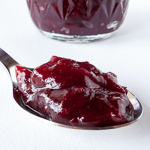 The recipe makes enough for 5 or 6 half-pint jars of jelly, though the last jar may not be completely full. If it has too much headspace, more than 1/4-inch (0.5 cm), do not try processing as it will not seal properly. Put it directly in the refrigerator and use within a week or so. 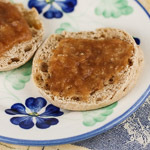 This jelly recipe has an adequate acid level to make it safe for boiling water canning. Before making the jelly or preserving any type of food, take time to read about the boiling water canning method and check out the resources mentioned in the post, including the list of canning cookbooks. This is my contribution to Grow Your Own, a blogging event that celebrates the dishes we create from foods we’ve grown, raised, foraged, or hunted ourselves. Gay of A Scientist in the Kitchen is our host for this round, so be sure to visit her blog for more information about submitting your post. If you are new to the event, you can read more about the rules for participating at the Grow Your Own page. Adapted from The Ball Complete Book of Home Preserving. In the blender or food processor, puree the peppers with 1 cup (250 mL) of the cider vinegar until smooth. In the large stainless sauce pan, add the pepper puree, sugar, and the remaining 1 cup (250 mL) of cider vinegar. Stir. Bring to a boil over high heat, and continue boiling while stirring for 10 minutes. Stir in the pectin and food coloring (if desired). Boil hard, stirring constantly, for about 1 minute. Remove from heat and quickly skim off the foam. Quickly pour the hot jelly into the jars, leaving 1/4 inch (0.5 cm) headspace. Wipe the rims clean. Center the lids on the jars and screw the bands down, just until your feel resistance. The bands should be fingertip tight, not too tight. Place jars in the canner, ensuring they are completely covered with water. Cover and bring to a boil and process for 10 minutes. Remove the canner lid and wait 5 minutes. Remove the jars and allow them to cool completely. The lids should pop as they seal. Store in a cool, dark, dry place for up to 1 year. If the lids do not seal, then you must reprocess or store in the refrigerator and use within a few days for safety. Prepare all of your canning equipment using the instructions in Home Canning (Boiling Water Method). Total Time does not include processing. I’m curious how they taste, sweet and hot? Have you considered using the leaves? Here, our own local chili – siling labuyo, is commonly used in a dish called tinola or in fresh corn soup. Hi Gay! Jalapenos can be mild or hot depending on how long they have been left to ripen. The longer they stay on the plant, the hotter they get. I’ve read in a couple places that the leaves are poisonous if consumed in large quantities, so we don’t eat them. I am here!! This look exceptional Andrea! Something I need to give a go. Andrea, I love the color of your Jalapeño Jelly! And how good it must taste on crackers and (I’m guessing) cream cheese? I started canning Habanero Gold jelly earlier this year, and already I’m down to one jar. Your picture has given me such a craving that I may just cave and open that last remaining jar. Wow! Very tasty – I left some of the membranes in and it has kick!! 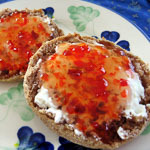 I would like to know if there are other ways to use this jelly in recipes besides just on crackers with cream cheese? Thanks! Hi Karen, we like it on toast and even with fajitas and quesadillas. Thanks for the recipe and great photo. 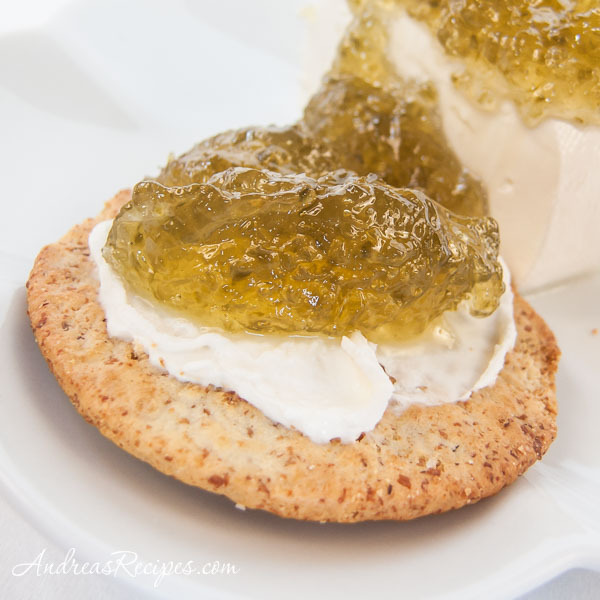 I usually buy my pepper jelly, but this is outlined in a way where I think we will have to give it a try! Some of the pepper jellies I have eaten vary significantly from one producer to the next. On a scale of 1 to 10, how would you rate the “heat level” of this recipe? Hi Jeff. The heat level depends on your peppers, which can of course vary depending on the growing conditions. Leaving in the seeds and internal membrane will ensure a hotter jelly. How many jalepeno’s does it take to make 12 ounces? Hi Anne, good question. Like other peppers, jalapenos can vary in size, so there is no hard and fast number of peppers per ounce. Last year our jalapenos were on the smallish side and it took 25 to make 12 ounces, other years it has been less. Weight is important to achieve proper consistency, so I highly recommend weighing the peppers. About how many jalapenos make 12 ounces? I have an abundance and want to use as many as possible! Thanks! Please make these recipes so that the recipe only can be printed out, not the recipe and all the instructions, ads, photos, etc. Thank you. Hi Cathie. There is an announcement on the right sidebar stating that I am working on providing text only printable recipes. I have several hundred recipes on the site and each has to be done individually, so the process is taking a while. Currently you can click the print button near the title of each recipe and print the recipe without the ads, but that option includes the photos. Thanks for visiting and trying the recipes! Thanks for the recipe! I’ve always loved this jelly and I finally have a good supply of jalapenos from my garden to make it myself! I usually put cream cheese on crackers and top with this jelly. Yum.. best snack ever. Thanks!